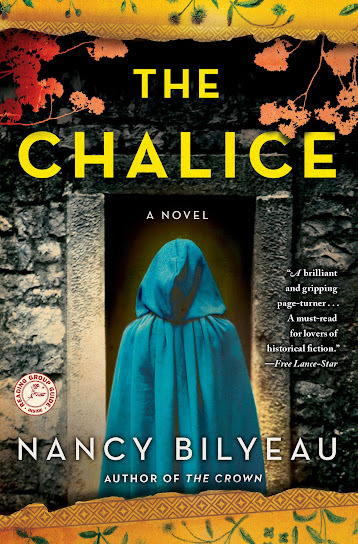 Last year I had the pleasure of reviewing Nancy Bilyeau’s thrilling historic fiction novel The Chalice! I am excited to announce Touchstone Books is now releasing The Chalice in paperback! (On-sale March 18, 2014; $16.00 paperback; 978-1-4767-0866-9; Touchstone Books). I am also posting a giveaway for the paperback novel so check my giveaway posting for details! The Chalice is the second in Bilyeau’s The Crown series. In The Chalice, Bilyeau returns to the story of Joanna Stafford, a young aristocratic nun whose cloistered way of life came crashing down when King Henry VIII ordered the dissolution of the monasteries. Joanna has already felt the wrath of the royal court, despaired as a prisoner in the Tower of London, and narrowly escaped death while at the mercy of the most powerful men of the era. Yet, with England in the midst of bloody power struggles between crown and cross, she leaves her quiet country life and is drawn into a shadowy international plot targeting the King himself. three different seers, each more omniscient than the last. Repelled by violence, Joanna tries desperately to seize a future with a man who loves her. But she cannot escape the spreading darkness and, to defend the future of Christendom, agrees to serve the Holy Roman Emperor by leaving England and all she holds dear to seek the final, sinister piece of deadly prophecy—and the meaning of the chalice that lays at its center. Is it Joanna’s destiny to save the kingdom and her beloved faith—or to destroy them both? This fast-paced historical thriller not only tells an epic story of a young woman fighting against the most powerful men of her time, but also takes a provocative look at the religious conflicts of the Reformation and those who would use violence as a means to an end.